In the vast majority of cases, computers load their programs and data from an internal HDD (Hard Disk Drive). Hard Disk Drives are basically boxes of rotating disks which use a stylus to read data from the disks. They are fitted internally to PCs and laptops and need to accelerate to operating speed for data to be read. A 5400rpm hard disk will need to accelerate to 5400rpm, the stylus will need to move to the disks, find the required files and retrieve them. The above process obviously causes wear, generates heat, generates noise and uses power. Because SSD is a Solid State Drive, it uses less power, it is virtually silent, generates virtually no heat and there is no wear (there are no moving parts). SSD units (Solid State Drives) are basically boxes of memory. This is why a quality SSD is far more reliable, silent, generates minimal heat, uses minimal power and is always significantly faster than a hard drive (the drive does not need to accelerate to operating speed and the stylus does not need to search the drive for data). Overall, an SSD drive is usually the best single upgrade that can currently be made to most computers (tower PCs, desktop PCs and laptops), followed closely by memory upgrades. Although the capacity of SSDs tends to be lower than Hard Disk Drives, in most cases this is not an issue. Warning; counterfeit SSD drives are currently available via online auction sites, Amazon iOffer etc. These should be avoided at all costs. 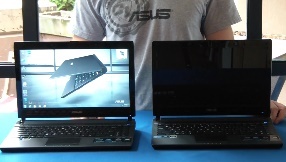 Please note that we can clone the original laptop hard disk drive to the new Solid State Drive. The cloning process is performed in such a way as to ensure that no data is destroyed Your Data is Safe with Us). 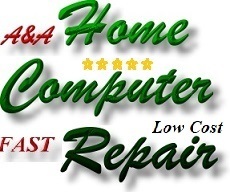 Please note that we can perform a full Windows installation (with the correct drivers and all Windows Updates). This will often include the transfer of your data to the new Solid State Drive when the process is complete. We install and configure the new Solid State Drive in your laptop. 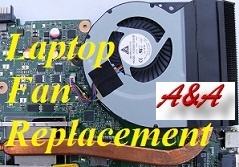 Your original Laptop Hard Disk Drive could then be securely erased and destroyed. 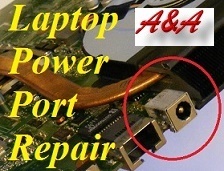 Your original Laptop Hard Disk Drive could be fitted into a spare hard drive bay (with your data intact).. Your original Laptop Hard Disk Drive could be fitted into an external (USB) hard drive caddy (with your data intact). Your original Laptop Hard Disk Drive could be fitted into your DVD Drive bay (with your data intact). If required, your DVD drive could be fitted into an external (USB) DVD drive casing. Please note that we can clone the original PC (Personal Computer) hard disk drive to the new Solid State Drive. The cloning process is performed in such a way as to ensure that no data is destroyed Your Data is Safe with Us). 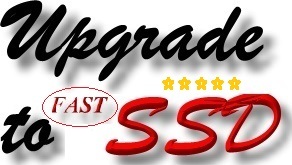 We install and configure the new Solid State Drive in your PC. Your original Computer Hard Disk Drive could then be securely erased and destroyed. Your original Computer Hard Disk Drive could be fitted into a spare hard drive bay (with your data intact).. Your original Computer Hard Disk Drive could be finstalled into an external (USB) hard drive caddy (with your data intact). Your original Computer Hard Disk Drive could be cloned onto a 2.5" hard drive which is then installed into an external (USB) hard drive caddy (with your data intact). Your original Computer Hard Disk Drive could be fitted into your DVD Drive bay (with your data intact). If required, your DVD drive could be fitted into an external (USB) DVD drive casing or we could supply an external (USB) DVD ROM Drive. Please note the the above (Apple Question Mark) indicates that the Apple iMac, Apple MacBook, Apple MacBook Pro or Apple MacBook Air cannot access the boot device. This will typically be due to hard drive failure. 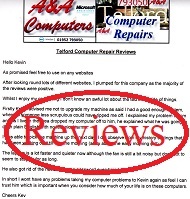 A&A Telford Computer Repair can replace the faulty Apple Hard Disk Drive with a new Apple compatible SSD (Solid State Drive) and reinstall the correct version of OS X. 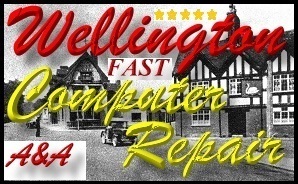 We have considerable experience in the field of computer storage (please see Wellington Shropshire Computer Repair Reviews), and in most cases A&A Wellington Telford Computer Repair even clone a customers existing Hard Disk Drive to a new SSD unit (please note that most tower PCs and Desktop PCs require an adapter - which we usually stock). 57 Orleton Lane, Wellington, Telford.